A smart solution for a safe front door with various functions. For example, you can choose from 52 different ringtones. The Cleverdog doorbell connects directly to your Wi-Fi network and can be used with the same app as the Cleverdog cameras. With this wifi doorbell you never miss a visitor again. Whether you are at home or outside the door, you always receive a notification on your phone when someone rings the bell. You can then see the visitor directly via the App and communicate with him. The camera with a viewing angle of 165 ° ensures that you can always see who is at the door (in HD quality, 1080P). These images can be viewed via your smartphone or tablet. The camera is equipped with infrared LEDs. These ensure that you always have clear images (up to 3 meters) when it is dark. In addition to seeing who is on the phone, you can also communicate with the visitor through the built-in microphone and speaker before you open the door (2-way communication). 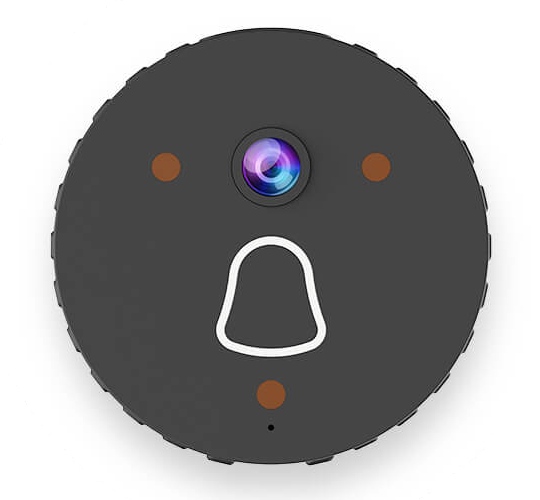 You can also use the doorbell as a camera , wherever you are. This way you can watch remotely and take a picture with your smartphone. The live images can also be viewed with the Windows PC app. The bell is powered via the two wires of your existing doorbell and the power supply connected to it. Then a data and communication signal is sent to your mobile devices via WiFi. U The bell can also be connected via the supplied micro USB cable. Cleverdog WiFi Doorbell. A smart solution for a safe front door with various functions.